One of the best relationship coping mechanisms that I have in my tool box and share with clients is that of “qualifying intention”. Let’s face it, sustaining a loving, healthy, and communicative relationship can be challenging from time to time. It’s not that our ‘love’ falters, but the little frustrations in our daily life tend to interfere with ‘that loving feeling’ we hope to cling to in our intimate relationships. We become impatient and annoyed by relatively inconsequential habits and/or attitudes and ultimately begin to make assumptions about the person’s meaning or ‘intention’. In each case, there is a statement or behavior that is interpreted and processed as a conclusion that in turn, generates some element of defense. 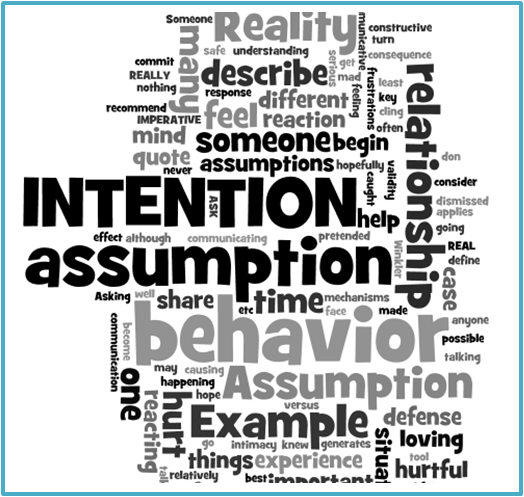 The assumption is a thought in our head and it is IMPERATIVE that we CHECK the assumption for validity BEFORE we REACT! In all of the cases above, the assumption is clearly ONE possibility but the REALITY is also a possibility and very different from the initial assumption – generating a VERY different reaction!! The key here is to recognize YOUR OWN defensive reaction. Ironically, we only react negatively to things that are threatening – things we feel the need to defend against. So… when you discover/recognize that you are behaving / speaking defensively, make sure you are defending the INTENTION of the person / situation you are reacting to. “In my mind, when someone (describe behavior), it means (define your understanding), is that what you INTENDED? In many cases, the response you receive will (hopefully) not be one of a defensive nature and you can engage in a productive / constructive conversation about what is REALLY happening versus the automatic assumption that you have made. In any case, before you react to someone, especially a romantic partner (although this topic applies to communication with practically anyone!) – Remember that your assumption is one of potentially – many – possibilities for the other’s behavior. Be sure that you are reacting to something REAL.